Addon bundle is a collection of all six addons for Styles & Layouts for Gravity Forms plugin. You will get all of them in single purchase and at very discounted price. 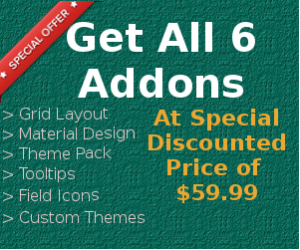 These addons are worth $175 when purchased individually for single site but for limited time you can get them at $89.99 $59.99. Do I Get Updates for Plugins? Every purchase get updates for one year. You will need to renew your licenese key after one year to keep getting updates. The addons will work even if you don’t renew your license. Renewal licences have 30% discount from purchase price. How do I Download the Addons?